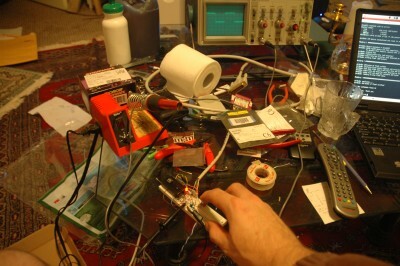 An open source, open hardware interval timer for digital cameras. The goal of this project is to make a simple, open interval timer platform available for time lapse photography based on the Atmel AVR platform. 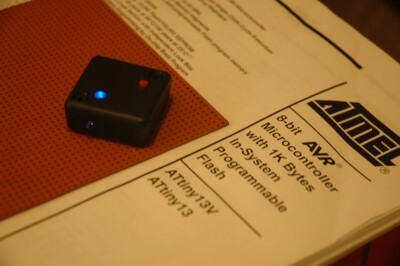 Currently, this project only supports Nikon cameras that support the ML-L3 IR remote. Support for other cameras is more than welcome! Much credit is due to Michele Bighignoli (www.bigmike.it/ircontrol) for putting the ML-L3 output waveform on the web. Thank you! Because it lets you make neat stuff like this. So, I’ve been sick for the last few days and stuck at home with a runny nose (that’s what the toilet paper is for…the M&M’s are for morale). I finally opened up a box of parts I ordered when I ordered the parts for Jen’s glowing heart. This box had a couple of Atmel microprocessors, infra-red LEDS, and a bunch of other goodies. The original idea I had was to build a programmer for the microprocessors, and a make one of them control the shutter on the Nikon D70s. I finally got around to it, and thanks to the weight of my new o-scope (lighter means I’m actually inclined to USE it) I just dialed in the trigger! So, here is the fist picture taken with the wireless trigger! YAY! PS. The square wave on the oscilloscope is a portion of the actual signal firing the shutter for this picture. Operation is pretty simple. Press the button once to turn the timer on. When it turns on, it’s in “learning mode” and the blue LED is ON to indicate this. While in “learning mode” the timer is measuring the time between your first button press, and the second. The time measured will be the interval between shutter releases. For example, if you want one picture taken every 10 seconds, press the button once to enter “learning mode” – wait 10 seconds – the press the button a second time. Two registers are used to measure time so the timer can fire more than once per second, or once every 10 minutes, or any amount of time between. You are not limited to preset intervals, or multiples of any measure of time (except for the processor’s clock period). Once you’re done taking pictures, press the button again, and the timer will go to sleep until you need it again.